You are here: Home / President’s Post: Are Stealth Evangelists taking over YOUR public schools? To Parents and Concerned Citizens – Delaware Valley Americans United (DVAU) needs your help! Stealth evangelism in our public schools is a problem that is not going away and we need our supporters to help identify school districts that are affected. 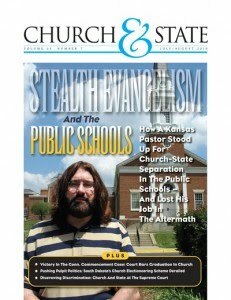 Reports of stealth evangelism in public schools have come from Hamilton, NJ, Chester County, Pa, and Philadelphia, and we want to identify as many school districts as possible that are in jeopardy. And this is where we can use your help. Groups involved in stealth evangelism go by many names and bill themselves as after school “Bible Study” groups or purport to offer “Personal Relationship” or “Values” training for students. When you take a closer look, however, it turns out that their real mission is to convert children to fundamentalist Christianity and encourage them to proselytize to their “unchurched” peers, all the while promoting the false impression among the children that their activities are endorsed by the school. I describe these activities as “stealth” because they involve deceit and misdirection. As journalist Katherine Stewart notes in her book, The Good News Club, the tactics used by these groups involve tricking parents into thinking that they are simply teaching kids universal values; tricking kids that their programs are part of the school; tricking the authorities that adult-run programs are run by kids; and more. The willingness to deceive shows that these groups have little respect for the schools, the parents and the communities they enter. This group alone is funded by a $300 million national organization, and there are 3,500 Good News Clubs in schools nationwide. We need to get a better handle on where stealth evangelism is occurring and need to hear back from you. Because of the “stealth” involved, we have discovered that many administrators, teachers and even union leaders may not be aware of the presence of these activities in your schools! In order to get this information, you may need to ask other parents and even students themselves in addition to teachers, principals or guidance counselors. * Ask if there are clubs or before-school gatherings being sponsored by outside organizations. * Ask your children or their teachers if students have been presented with a school assembly on “values” or “beliefs” or spiritual themes. * Ask your middle or high school student or their teachers whether “relationship” education has been a subject of an outside speaker. * Go to your local school’s website and look for after school programs such as “The Good News Club” or any other red flags suggestive of stealth evangelism. This could be in the form of after school clubs or assemblies during school hours. Whatever you discover, even if it is nothing, could you please report back to us? This will all be a part of our research. And even if you are not sure if what you find is relevant, let us know the nature of your findings and we will research further. In response to this call to action, DVAU is planning a number of workshops this Fall in order to address the question of “What Can We Do?” and equip parents and concerned citizens with the necessary tools to address this issue. Thanks for your help with this initiative. If church/state separation stands for anything, it stands for our public schools remaining neutral with respect to sectarian religious views. Please contact president@dvau.org with any information.